Home » Blenders & Juicers » Juicers » Which is the Best Juicer Under $100? Which is the Best Juicer Under $100? When you want to buy a juicer you should know that not all work the same way. Different juicers have different specifications and their ability depends on the features. Choosing the best juicer to fit your needs and at the same time shopping for the best juicer under $100 can be tough but possible. 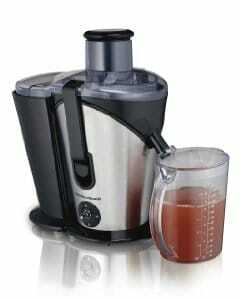 The best type of juicer, especially for juicing greens is a masticating one. They crush foods very slowly, thereby reducing oxidation of the juice and expelling very dry pulp. However, even though they work faster, they cost a lot more than centrifugal juicers that cut fibres and aren’t as efficient when getting all the juice out without any pulp. Unless you’re a health nut and juicing fanatic, a good centrifugal juicer will be enough and you’ll have more options for finding the best juicer under 100. If, however, you want the best juicer you can get for your money, take a look at these centrifugal and masticating units. If your budget is $200, we have some in that range too. Here are some of the specifications to look out for when looking at the top juicers under 100 dollars. Motor power controls the speed of the blade. Harder fruits and vegetables require a high motor power to make you a cup of juice with ease. The motor power is also important for the speed at which you juice. The wider the feeding chute the less prep work you will do before adding your fruits and veggies in. The various parts of the juicer should be easy to clean and easy to assemble after cleaning too. Disassembling your machine should not be trouble either. Most of the parts should be safe to wash in the dishwasher. When using the juicer, the blade runs at a high speed and you risk being cut if the feeder does not have a tight lid to close. Consider buying a juicer with a locking cover to make sure you are not at risk while operating your machine. While speed matters, make sure that it doesn’t interfere with how efficient it is. If you get too much wet pulp at the end and not a lot of juice, you’re wasting a lot. Keep in mind that a blender like a Nutribullet is not a juicer. A juicer removes pulp and gives you pure juice, while a Nutribullet incorporated the pulp and gives you a smoothie. If that’s what you want, you can also find some good blenders for under $100. For more choices of inexpensive juicers, take a look here. If you’re only interested in citrus juices, take a look at some good electric citrus juicers. Otherwise, here are some of the best products with different specifications for your budget. This machine is strong and efficient, with a rating of 700-watt and it operates at 14,000 RPM to give you your glass of juice as quickly as possible. The Breville BJE200XL Compact Juicer’s titanium dual blade assembly and extra wide 3” feeding chute are centered, and the stainless steel micro-mesh strains the juice so that you don’t get any unpleasant fibre in your drink. The pulp collects in a separate circular chute inside which you can scoop out by opening up the lid on top. A cleaning brush is provided so you can clean the mesh and other hard to reach places easily. The detachable parts are also dishwasher safe. Owners of this machine like its compact size because it can fit under a cabinet and on the kitchen counter. While a few users mentioned that the pulp created was too wet, most users say that that happens only if you try to cram food in too fast. You have to take your time and let it do its job. If you feed it correctly, the pulp will only be damp. In fact, this may be the best juicer under $100. This Big Mouth Juice Extractor from Hamilton Beach has an 800W motor power and you can choose between a model with only one speed (67608A) and one that comes with two speeds (67750). It comes with a large pulp container and the 1-speed model includes a 20 oz juice pitcher, while the 2-speed model has a 40 oz pitcher. The lid includes a froth separator. Only dry pulp is expelled into the pulp bin and all the juice is filtered out into the pitcher. The extra wide feeding chute allows you to drop in whole foods without having to cut them up. It is probably the best juicer for the money and you won’t get a more efficient one at this price. The parts can go through a dishwasher except the metal centrifuge, which only needs the cleaning brush. Be sure to clean up the pulp after making your juice and not let it harden. Assembling the parts after cleaning is quite easy. Customers who have bought the machine have praised its ability to make juice from different produce like carrots, apples, ginger roots, celery, kale and many others with ease. You can choose the higher speed for things like carrots, apples and beets, and the lower speed for soft foods like strawberries, watermelon and leafy greens. The Black & Decker JE2200B juicer is the most pocket friendly in this list and has all the necessary features that a good juicer should. It features a 400W motor and stainless steel cutting blades and strainer. It comes with a 300ml juice cup that is specially made to ease measuring, pouring and serving. The large pulp container is integrated in the machine so the total space taken up on your counter by juicing is quite minimal. It works by a simple on/off switch and there’s a locking mechanism for additional safety. You need not worry about cleaning, as all its parts are dishwasher safe. It also features inbuilt cord storage. The chute is a bit small so you have to cut up larger fruit first. It is a great juicer for all kinds of fruits, but if you want to do greens you will probably have to pass the pulp through a few times to get a decent amount of juice extracted. However, this is the best juicer under 50 dollars and is a great one for beginners. If you want an inexpensive juicer that comes with almost every possible feature, the Kuissential 2-speed Juice Extractor is a good choice. This machine offers a motor power of 700 watts, which is relatively high for its price, and can help you make your juice in good time. It comes with 2 speeds, so hard and soft fruits and vegetables can be juiced efficiently. It has a stainless steel body and cutting disc and an extra-wide chute minimizes time spent prepping food. When pouring the juice out from the jug, its lid’s lip holds the foam back so you can enjoy your juice without much foam. Its parts are dishwasher safe – a jug, a large pulp collector and a filter basket. Cleaning the parts is easy and the included cleaning brush is useful for the cutting disc. The safety features include a locking arm and overload protection. People who have bought the machine praise it for the job it does with fruits and vegetables like carrots and beets, however, it does not do a good job with kale and other greens. While a really good masticating juicer usually costs above $200, the NutriChef Slow Juicer does a pretty decent job for its low price. While its motor is not all that powerful at 200W, it is good enough to produce high quality juice that’s full of essential vitamins and that does not oxidize fast. This is because its slow spinning auger crushes fruits and vegetables at just 80rpm and produces almost no nutrient-destroying heat. You’ll get a high ratio of thick juice to pulp waste with very little foam, as the juice is extracted through a micro-mesh filter. This is the juicer to get if you’re also going to be juicing a lot of vegetables that don’t typically yield much in centrifugal juicers. Unlike most masticating juicers that have a horizontal design, this one is vertical so it takes up little counter space. The very dry waste is expelled out of the side and there’s very little chance of clogging. The parts are a little tough to clean either by hand or dishwasher, but a cleaning brush is included to help you along. You’ll also get two 600ml jugs that can hold the juice and pulp. The feeder tube is not all that wide so you’ll have to cut up large pieces of food first, but for this price, it’s a small inconvenience. Some users also say that they don’t get a lot of juice out of each batch but if you want more you’ll have to spring for a more expensive masticating juicer, like one of these.